Our CoQ10 products contain only the 100% natural, all-trans form of CoQ10 produced by fermentation. Q.What is CoQ10 and what is it good for? 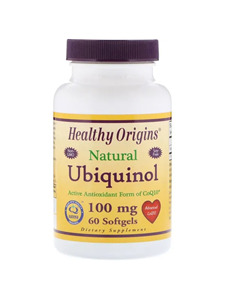 A.Ubiquinone and ubiquinol are both forms of CoQ10, and both are necessary to produce cellular energy. Ubiquinone is the oxidized form of CoQ10 that consumers are most familiar with; it has been taken as a supplement and studied for more than 30 years. Over the past three decades, CoQ10 has been recognized for its benefits to general health and wellness as well cardiovascular and neurological health. In order to generate cellular energy, the body must convert ubiquinone into ubiquinol. Without this conversion, the body's energy production process cannot be completed and energy levels cannot be sustained. Thus, both are critical to sustaining your body's natural energy. As the body's ability to produce and reduce CoQ10 declines as you age, it is believed that those who are 40 and older or are affected by age-related health conditions may benefit from this pre-converted form of CoQ10 more than those who are younger. A.Declines in Ubiquinol result in less cellular energy and diminished protection against oxidative stress, which produces free radicals and can damage the body’s cells, including proteins, lipids and DNA. Ubiquinol provides a strong first-stage defense against this cellular oxidative damage and needs to be replenished to maintain optimum health. An increasing number of scientific reports indicate that dramatic decreases in ubiquinone levels and increased oxidative stress are associated with the aging process and with many age-related conditions. A.As a healthy 20-year-old, you readily produce all of the CoQ10 you can use and efficiently convert it into ubiquinol. In fact, the predominant form of CoQ10 in the plasma and tissues of a healthy individual is the reduced ubiquinol form. However, age and other factors can hinder the body's ability to produce and metabolize CoQ10. Some reports say this decline becomes apparent around 40 years old, although it can begin as early as 20 in some cases. As the body's ability to produce and reduce CoQ10 declines as you age, supplementation with ubiquinol becomes increasingly important for maintaining good health. A.Yes. There are three major factors that lead to deficiency of CoQ10 in humans: insufficient dietary CoQ10, reduced biosynthesis, and increased utilization by the body. The literature is still inconclusive about whether biosynthesis or dietary intake is the major source of CoQ10. However, the biosynthesis is a multistep process requiring many other nutrients, and so a diet low in nutrients may lead to decreased biosynthesis. This implies that the 'normal levels' established now may be suboptimal, given the fact that suboptimal nutrient intake is almost universal in humans. Biosynthesis also can be affected by aging and certain medications (statins, blood thinners, etc.). Some chronic disease conditions (cancer, heart disease, etc.) reduce the biosynthesis and increases the demand for CoQ10 in the body. Recent evidences suggest that mutations in some genes also lead to CoQ10 deficiency. Products of these genes are thought to be involved in the metabolic pathway leading to CoQ10 production. To truly satisfy yourself, please study our reference and case study sections of this web site. A.Unfortunately, most doctors in India are not familiar with the published research regarding the potential of CoQ10 because many of the journals they read rarely discuss the benefits of coenzyme q10. The reason for this is very simple, nutrients cannot be patented and as a result, there is no money in prescribing coenzyme q10. That's fact - not cynicism. So with no money to be made, there is very little interest to pharmaceutical companies and drug manufacturing laboratories, and these are the companies that sponsor and publish most of the journals read by doctors. The rest of the world has reacted completely differently to coenzyme Q10. For instance, Japan is the world's largest consumer of coenzyme Q10. In fact, CoQ10 is the fifth most commonly prescribed drug in Japan. A.Ubiquinol is not a quick fix for those looking for increased energy. Unlike caffeine or sugar which boost energy levels quickly and can cause a “crash” later, Ubiquinol offers sustained natural energy. Although each individual is different, it generally takes two to three weeks to restore optimal CoQ10 levels in blood plasma and tissues, most people will begin feeling the effects as their individual plasma levels start to increase, generally around the fifth day. I respond to this much, much better than CoQ10 supplements. I'll be sticking with this. It decreased my fatigue within a few days.